Discussion in 'News & Announcements' started by aXed, Feb 6, 2019. One of our staff accounts was compromised, we have no choice. As you guys have noticed there is no newsletter this month. I've not been able to reach the goals of last month due to my personal mental health. I do not like talking about this since it shouldn't affect the server but it does. However, I will get to my old self one way or another and we have a great head admin team that has offered tons of help. One thing I've been bad at is allowing people to help more during resets, or by adding extra content. This has and will be changed more so that updates and resets become more frequent. Sorry for all that has happened or rather sorry for all that has not happened. 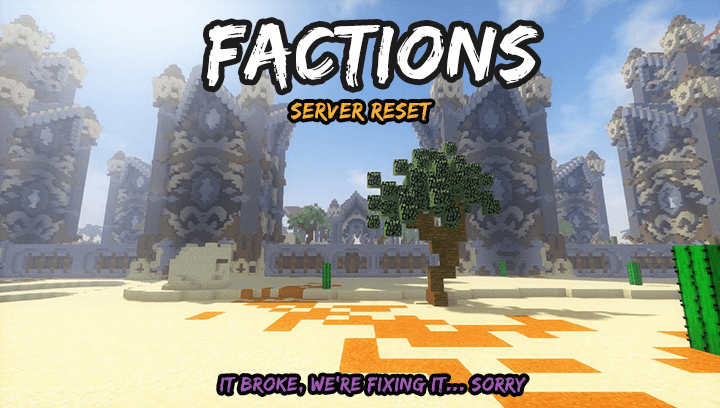 Due to having to reset suddenly some new content is not finished yet and will most likely be enabled later during the reset. What about the ftop prizes since my faction won ftop 1? Honestly dont care too much but Haip!! @aXed I hope you get well soon m8. Also really hyped for this reset. better setup that 2fa now tim! WHERE THE **** IS PRISON RESET IT HAS BEEN 494 DAYS TF U HIGH?